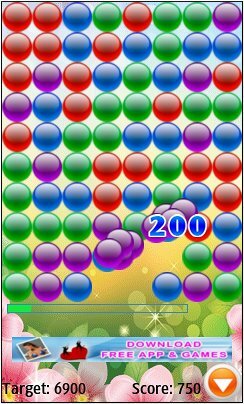 A touchscreen bubble popping game. Tap groups of three or more bubbles to pop them. To advance to the next level you need to pop an ever increasing number of bubbles before time runs out. A touchscreen phone is required, the game is not playable on non-touchscreen phones. The app “Bubble Mania Deluxe” (508 KB) is ready to download or send to your phone as filename: “BubbleMania”. What game can download?my phone is android samsung. Not here, these apps are for feature phones. Use the App Store on your lPhone to download iPhone apps. Online download from the .jad errors out with NoClassDefFound on the LG 840G. Same with direct install of the .jar from microSD card. Error can be seen in MicroEmulator. It looks like a problem with a SAX (Simple API for XML) instruction. There’s a patch version of that on Sourceforge. It might be as simple as a drop in file replacement somewhere in the .jar but there are a lot of classes to sort through. Might have to phone a friend on that one. If I figure it out I’ll send the patch method.